Australia, 1913 to 1998 Mostly Used Collection, In mounts and housed in Scott album, a useful group, generally Fine to Very Fine. 2017 Scott approximately $2,000+ (Owner's). 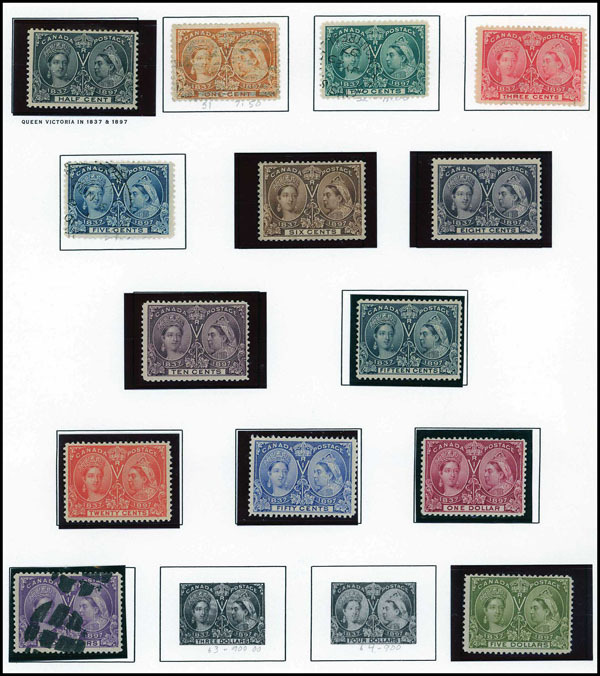 Canada, Extensive Mostly Mint Collection, Few thousand from 1852 to 2008, early issues used, 1897 on mostly mint o.g., later issues n.h., better items include used #4-5, 7 (repaired), 8, 17-19, Large and Small Queens with varieties (some o.g. ), 61-62, mint 20 (unused), 51-60, 66-84, 89-95, 96-103, Admiral issues including varieties, 1927 on mostly complete, to about 2000, Back-of-the-Book issues mostly complete o.g. including F3 (unused) and O9, very attractive collector made collection, mostly Fine or better. Canada, Interesting Collection, Many hundreds from 1852-1979, early issues used mostly mint from 1946 on later issues n.h., better items include used #4, 17-19, Jubilee issues complete ($1-$5 used, balance o.g. ), 66-84, 89-95, 158-159, mint 96-103, also Back-of-the-Book issues and small Newfoundland collection, generally Fine to Very Fine. Canada, Mint and Used Collection, Album leads off with used #4, 14/19, 21-30, 34-40 41-47 (with extra 47 and 48), Jubilees mint/used from ½¢ to $4 (no $3), with the ½¢, 1¢, 2¢ and 6¢ mint and all the rest used, dollar values have varying heavy cancels (Cat. $3,500+), 66-73 mint/used ($1, 430), all Admirals complete mostly used, then virtually complete mint l.h. to mid-1960's, incl. Airmails, Special Delivery, Dues and Officials, Provinces include some better sets in Newfoundland and a scattering in some other Provinces, generally Fine to Very Fine. Canada, 1859 to 1990 Collection, in mounts in Scott Specialty album, mostly used to 1939, then mint, noted #26, 34-47, 50-60 o.g., unused or used, 66-73 o.g., unused or used, then complete from 89, spot check shows QEII all n.h., Back-of-Book appears to be only missing O9-O11, generally f.-v.f. in 20th Century. Canada, 1859 to 1994 Collection, in two hingeless Lighthouse albums, noted used #20, 26, 34-40, 102 o.g., 119 n.h., 162-177 (50c used), E1-E3 o.g., spot check shows QEII all n.h. with many n.h. before, generally f.-v.f. in 20th Century. Canada, Face Lot, n.h., New issues from 1980 to 2002 on pages in blocks and min. sheets, along with few loose modern booklets, incl. $ and up, clean, face total Canadian $1189. Canada, 1859 to 1949 Mostly Used Collection, mounted on Scott pages and housed in binder, incl. first cents, large Queens, Jubilees to 50¢, Admirals, Bluenose, etc., no Back-of-the-Book, worth a look, mostly Fine to Very Fine. Canada, Intact Collection to 1990, sparse early used, strength in Jubilees incl. mint $1, used $2, mint $5, some Back of Book, scattered Provinces, Fine to Very Fine overall. Canada, 1888 to 1968 Mint and Used Collection, in mounts on hand made pages, used thru 1934, then mostly mint, incl. some shades, blocks and Back-of-Book, mostly Fine to Very Fine. Canada, 1911 to 2000 Mint Collection, Many hundreds in 3 Lighthouse hingeless albums mostly n.h., value mainly in modern issues but does include #122 and 262, Fine to Very Fine. Canada, Used Accumulation in 3 Ring Binder, many hundreds starting with small Queens with various cancels, continuing through Victoria, Edwards and later to 1960's, few back of the book, 19th Century mixed condition, 20th Century mostly fine to very fine. Canada, Used Dealers Stock, Thousands from 1859 to 2003 sorted by Scott number in glassines, including some Large and Small Queens, and some better commemoratives, generally Fine to Very Fine. Canada, Accumulation in Albums and on Pages, Few thousand incl. some used large and small Queens, 1930-1970's mint issues, and Back-of-the-Book issues, generally Fine to Very Fine. Canada, Modern Mint Accumulation, n.h., Many hundreds including booklets and blocks, Fine to Very Fine. Canada, Modern Face Accumulation, n.h., complete panes, virtually all 30c through $2 values, mostly 1990's and later, few booklets, face $430.